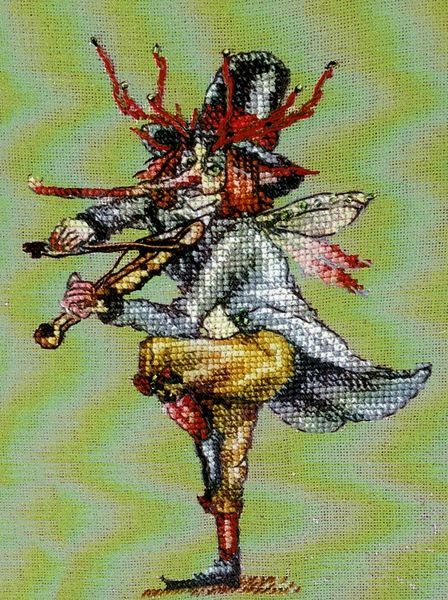 One of 'Robin's Orchestra', a strange fairy violinist with a long nose. The design is converted from the fantasy artwork of Helene Larbaight. The large scale black and white charts are printed 10 stitches to 3.5 centimetres on an A3 sheet with some backstitch and beads illustrated in colour. 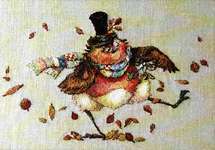 The pattern is worked in whole cross stitch, half cross stitch and backstitch using 18 shades of stranded cottons with 11 blended shades and small green beads over 65 by 89 stitches. The model was stitched on 36 count Edinburgh linen using DMC floss.